Kareena Kapoor kissed Sylvester Stallone in Kambakht Ishq,Kareena Kapoor and Sylvester Stallone in Kambakht Ishq,Kareena Kapoor Kisses Sylvester. A hot news that is going around in Bollywood and Hollywood alike these days is that Bollywood Actress, Kareena Kapoor recently kissed Hollywood Superstar Sylvester Stallone while shooting for “Kambakht Ishq”. Though in the movie “Kambakht Ishq”, Kareena stars opposite Akshay Kumar, it is Sylvester, who got kissed by the lady. This is for the first time that the Sylvester will be seen in a Bollywood movie and this in itself is a luck for Kareena to be in that first movie with him. 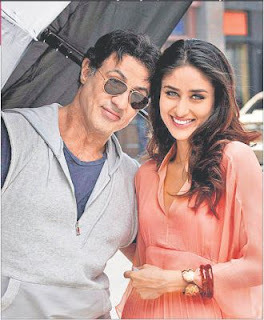 It has also been heard that Kareena Kapoor has been bowled over by Sylvester Stallone while shooting for “Kambakht Ishq”. Perhaps this is the reason that she kissed him while shooting for it.